Dramatic, picturesque, miraculous: that's Rocamadour, a must-see fortress and chapel of miracles in a dramatic setting in the Alzou Canyon. 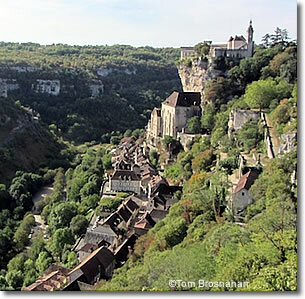 At Rocamadour, a miraculous chapel and several oratories cling to a precipitous cliff topped by a fortress looming above the dramatic steep-walled valley of the Alzou River. Since the late 1100s, pilgrims have made their way here to pray at the Chapelle Notre-Dame where an ancient black wooden figure of the Virgin Mary is said to have seen miracles of salvation. Today Rocamadour is still a place of pilgrimage, but more of the visitors are simply travelers curious about the place and its history, and its dramatic scenery. They ascend/descend the steep cliff in two elevators/lifts, or by switchback paths and staircases. You climb the crenellated towers of the 14th-century fortress, descend steps and ramps through a verdant garden dotted by Stations of the Cross, and penetrate the rock-hewn Chapel of the Virgin to glimpse the Black Madonna and the 9th-century bell hanging high on the ceiling that was said to have rung by itself when a miracle occurred. In the former 14th-century mansion of the Bishops of Tulle is the Musée d'Art Sacré Francis-Poulenc with collections illustrating the history of Rocamadour. As is the case in many small but crowded French tourist destinations, the most convenient car parking places are the first filled and most expensive. Your best plan may be to drive to the topmost parking lot, by the fortress, which is large and free of charge. After visiting the fortress and enjoying the panoramic views, descend to the chapel and the village by the Stations of the Cross path, or by the ascenseur.